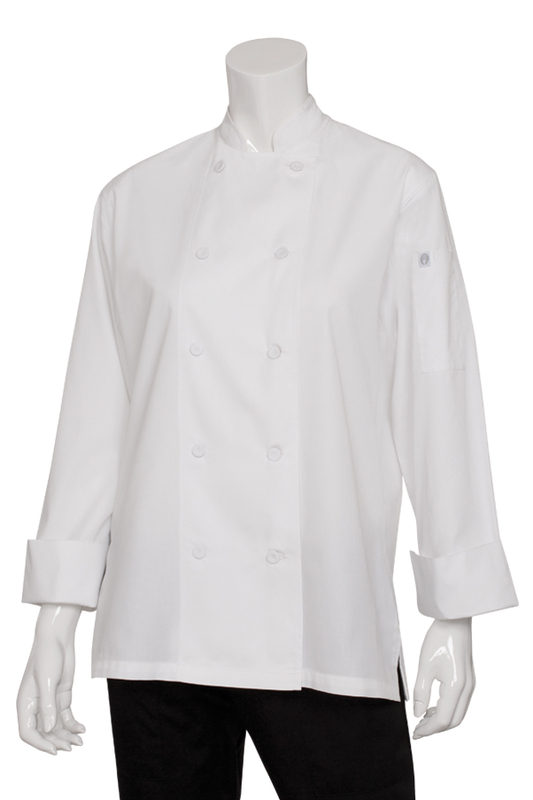 New "Lite" fabrics are here, and they are working their way into our range of chef jackets for women. How will this new trending development benefit you? 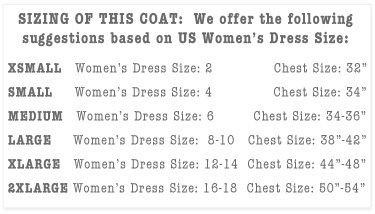 Simple, the weight of the fabric has been reduced from a typical 6.3 oz. poly/cotton to a Light Weight 4.6 oz Twill. Think of the old adage "That's a weight off your shoulders". It just feels lighter and cooler, and that's a breath of fresh air in a hot kitchen. You will notice however, that other than fabric type, everything else on the Sofia has remained unchanged. 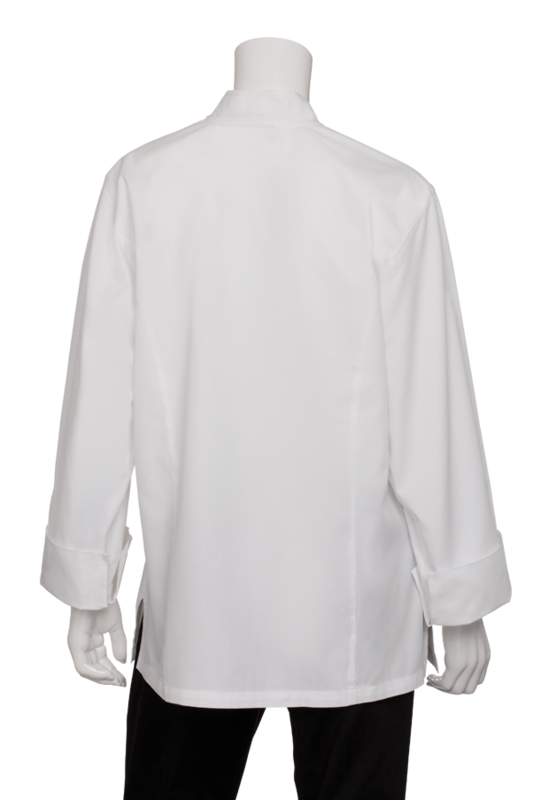 It's design and features honor the the timeless look of a classical chef's coat. It features full length sleeves with fold back french cuffs. The double breasted crossover front is accented with 10 white buttons. The Mandarin collar is traditional in its understated elegance. The left sleeve is equipped with a divided thermometer pocket, bearing the grey and white Chef Works circular fork emblem. Expertly tailored to fit our female clientele, the Sofia is proportioned to better fit a woman's neck line and shoulder width. Finished side seam slits help the jacket relax and fall nicely at the hip. This item can be personalized with embroidered text or corporate logo. Please click the "Embroidery" check box above the order butter for further details. 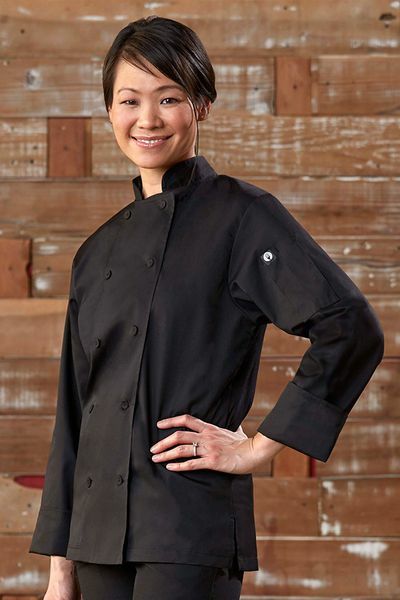 As a self taught culinary artist, Sandra is combining globally influenced flavors with budget savvy know-how to present us with sumptuous words, photos and a Weeknight Recipe Box full of ideas that answer the age old question, "What's for Dinner?". She answers, "What's for Lunch?" as well with wholesome packed school lunches for her own children, -Lunches so delectably crafted, even the teachers will be asking to trade. Sandra Says: "I am Sandra, author and founder of Sandra's Easy Cooking -food blog for simple and affordable meal ideas from all over the world. I love sharing my recipes and communicate with people that are foodies like me. Food connects people, and I connect well with both people and food! So these past 3 years have been very interesting and a pleasant food journey that I've been sharing via web, but also enjoying delicious meals with my family and friends. On the "Lite" SOFIA Women's Chef Coat, Sandra says: "I dressed in my new Chef's coat that I got from Chef Emporium - which is fantastic by the way; light, gave me more professional look, expertly tailored for a women and it's just cool even for us home cooks- but "must" for real chefs and of course it's great for catering businesses, cooking classes and so on. 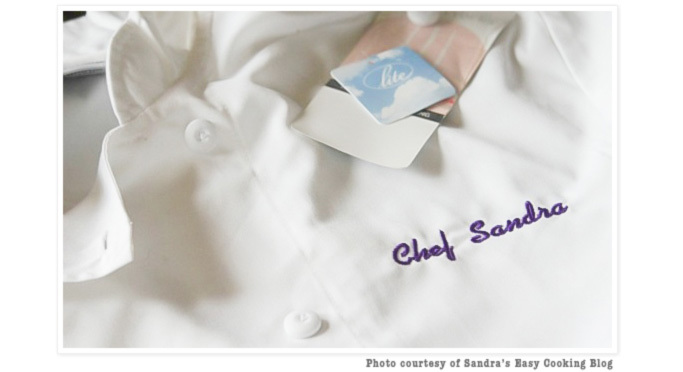 It was really great that I could just type my name and Embroider and personalize whatever I would like to be on the coat/jacket, so as you can see I wrote Chef Sandra. I love it!"